This electronics store chose Bitochon to design its website because they had seen samples of our website designs and development. 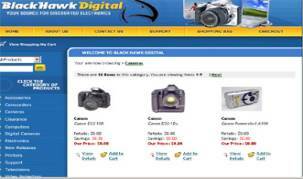 Customers can browse and order online the different categories of cameras and other electronic equipment. The website design includes photos of items for sale with a description of each item. Purchases can be made simply by filling out the order and using a credit card. This website design features a fully administrative front-end so that the client can manage the website content and keep it up to date.